​I am a native of Northern California who has lived in the Midwest, East Coast, PNW, and now Southern California (gasp!). I did my postdoctoral studies with Michael Emerman at Fred Hutchinson where I studied lentiviruses such as HIV. Before that I obtained my PhD from the WSBS at Cold Spring Harbor Laboratory studying alternative splicing with Adrian Krainer. If I am not in the lab, I am probably riding a bicycle, playing soccer, cooking, or listening to The Smiths. An LA native, Donna recently moved back after graduating with a B.S. in Biology and a minor in Chemistry from the University of North Carolina at Chapel Hill. While at UNC, she studied the dynamics of the cell’s cytoskeleton in regard to cell motility under Dr. Ken Jacobson. She became so enamored with the field of biology that she later joined Dr. Paul Maddox’s lab, in which she developed a GFP-LAP tag for HP1 to observe its properties during mitosis. Currently, in the Fregoso lab, she is focused on determining how the lentiviral accessory gene, Vpr, engages the DNA damage response. When not in lab, you can find Donna driving her Prius throughout the city finding the next best place to eat and playing aunt to her sister’s spoodle. Alex is an LA local, born and raised. Currently he is a Senior majoring in MCDB, also a transfer student from Cerritos CC. He is using evolutionary analyses to characterize novel antiviral factors, and is supported by a UCLA MARC fellowship. When not in lab or classes, Alex is usually out eating and learning to enjoy the outdoors more. 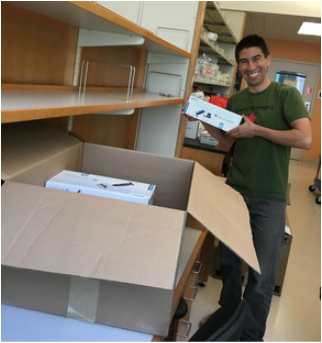 Andrew is a Los Angeles native from the San Fernando Valley and a PhD student in the Molecular Biology Interdepartmental Doctoral Program. Before coming to UCLA, he received a B.S. 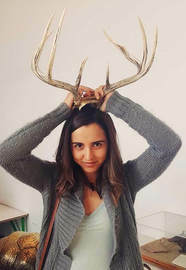 in Biological Sciences with a focus in Biochemistry and Molecular Biology from UC Irvine and spent a year participating in a post-baccalaureate research program at Yale University. Currently he is studying the effect of HIV-1 and HIV-2 Vpr protein on cell cycle arrest. During his free time he enjoys photography, watercolor, hiking, and playing Pokemon Go. He is also involved in diversity and outreach for the graduate program in biosciences (GPB). Graduate Student – Gene Reg. 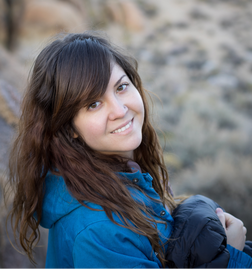 Originally from Orange County California, Carina is a Ph.D. student in the Molecular Biology Interdepartmental Doctoral Program. She received her B.S. in Biological Science with a concentration in Molecular Biology & Biotechnology and Chemistry minor from California State University Fullerton. 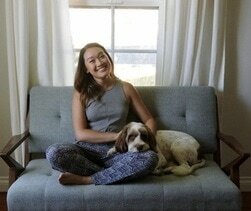 During her free time she enjoys reading at random coffee shops, hiking, practicing yoga, and playing with dogs. Ariel is a fourth-year undergraduate, majoring in Microbiology, Immunology, and Molecular Genetics and minoring in Biomedical Research. When she is not in the lab or studying, she spends her time doing martial arts and wrestling. Much like others here, she is an L.A. native and very excited to be part of and to learn from this lab. Andres is a current undergraduate student who grew up in a quiet little town in the middle of nowhere called Littlerock, CA. 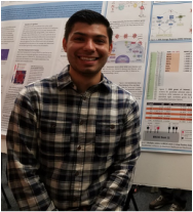 He is a pre-Microbiology, Immunology, and Molecular Genetics major and while still being new to the lab he can’t wait to help and learn in anyway he can. Despite not being used to the buzzing city of Los Angeles, Andres enjoys walking around Westwood with his friends. When he is not studying for his classes, he enjoys looking up cat pictures, listening to music (way too much Troye Sivan), and hanging out with his friends. 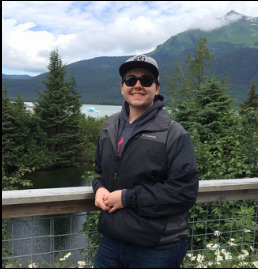 Originally hailing from the quaint city of San Francisco, Ian is a PhD student in the Molecular Biology Interdepartmental Doctoral Program (try saying that five times fast). Before moving to Los Angeles, Ian obtained a B.A. in Biology from Kenyon College in Ohio before spending two years with the NIH postbaccalaureate program in Bethesda, MD. When not in lab, Ian enjoys slaying dragons/zombies/space pirates on his computer and listening to books about other people slaying dragons/zombies/space pirates on his iPod. Ian also enjoys a spirited game of badminton and other nerdy sports. Ian graduated with an MS in June 2018! He plans to pursue a career in science education and teaching. 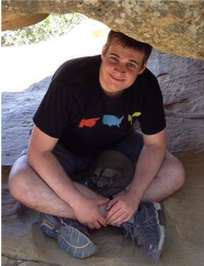 Cole is pursuing additional opportunities at UCLA, including teaching his own undergraduate course!